I've finally sorted out my Grand Canyon pictures. If you'd like to take a tour of the South Rim from Mather Point to Kolb Studio and Bright Angel Lodge--basically following along the rim trail, start here. I put 64 pictures on two pages, so dial up people be patient. Highlights include; Hopi House, El Tovar Hotel, Lookout Studio and Kolb Studio, all with at least some interior shots. Most of these images were taken April 17th. This isn't a colorful, showy tour as it was still winter and void of most flowers and greenery in northern Arizona, but I did the best I could for this time of year. 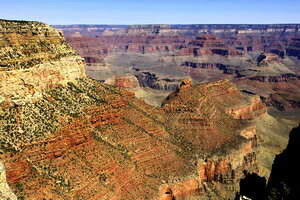 Click for tour of the South Rim. 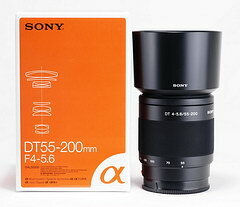 The next lens review up for careful consideration is the Sony DT 55-200mm F/4-5.6. This lens is very similar in performance to the Sony 75-300mm F/4.5-5.6. They're both the same price, and as far as I'm concerned, I'd pick the latter as it's a bit sharper at 200mm, and will work on full frame cameras of the future. It did turn in a good review though, and if 200mm is enough for you, it's a good bargain. In other news, after careful examination of the 50mm F/2.8 macro bokeh, I've come to the conclusion that it is about the same as the 100mm F/2.8 macro, I said below it wasn't quite as good. So that makes the 50mm macro all-around as good or better than the 100mm. 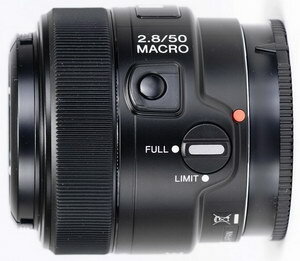 The Sony 50mm F/2.8 macro lens review is ready for you to scrutinize. This was an easy lens to check out, as it's nearly flawless. It's sharp at F/2.8, and very sharp from F/4 up to F/8. I think *the bokeh is not quite as smooth as the Sony 100mm macro, also tested here, but *that's about the only area where it might be lagging behind the 100mm. They're both very good for macro work, but If you're only going to buy one macro lens, I'd make it the 50mm. *After further research, I've come to the conclusion the 50mm macro bokeh is just as good as the 100mm macro. 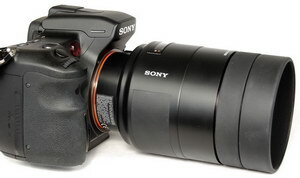 Also coming up is a review of the Sony 55-200mm kit type lens, an inexpensive plastic mount zoom. We'll see how sharp the long end is, traditionally a weak spot for Sony low-end zooms. 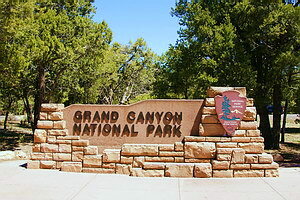 I'm also working on the other Grand Canyon pictures, the rim trail walk and hotel page, and another page on the hike down to the river and back. I hope to have them available next week. In between my reviews I decided to do something I've been thinking about the past couple of years; hike to the bottom of the Grand Canyon and back in a day. I took the South Kaibab trail down, crossed the Colorado river, passed by Phantom ranch, then took the Bright Angel trail up. I cracked off about 800 pictures, not all will be shown of course, about half are garbage. I'm going to split them up for viewing, probably the actual hike on two pages, then a page on the south rim hotels and shops, then a miscellaneous page. I picked out a few I liked and posted them here. I should have the whole set completed soon, so check back if you're a Grand Canyon fan. I'm starting up my lens reviews again, this time it's the Sony 500mm F/8 reflex lens, which is basically a telescope you attach to your camera. Its equivalent APS-C length is 750mm. This particular review is a little different than my other lens reviews, because of the fixed aperture and lack of zoom. I did include bokeh examples which can be quite pleasing if you have enough distance between the subject and background. Normally, the Sony 500mm reflex rates poorly for bokeh, but check out my sample shots. I don't have anything I can directly compare to this lens as far as sharpness-vs-length is concerned, but as soon as I do, I'll post the results. 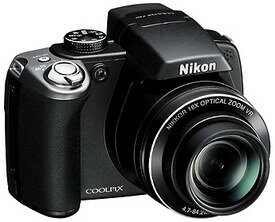 Nikon enters the compact super zoom arena with the Coolpix P80. I guess it's better late than never, like my posting here. This camera looks familiar, pretty much the same as the Panasonic FZ18, Olympus SP-550/560 or Fuji 8100fd, but much smaller than the fixed lens Fujifilm S100fs. If it's going to be a copy of the others, you might as well go out and get the excellent Panasonic FZ18 for about $100 less, at $299, this camera reviewed here. I won't be doing a review of the P80, or the following, but if you think you might like to buy one, make sure you check out the Olympus SP-570 with the manual rings, I'd like to know if it'll be any easier to manually focus. 2.7" LCD with 230,000 pixels. 13fps up to 30 frames at 3mp or lower. ISO 64-6400, 3200 and 6400 at 3mp or lower. A claim of worlds most compact super zoom. 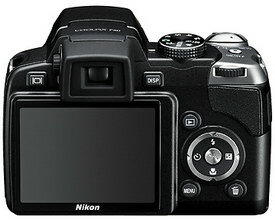 Image stabilization, or Vibration reduction as Nikon calls it. Face detection for up to 12 faces. Continuous shooting at 1.1fps at full resolution. D-lighting, same as Shadow adjustment technology on other cameras. 365g or 12.9oz without lens or battery. Lithium-ion battery good for a measly 250 shots. Body 4.3" X 3.1 X 3.1 or 110mm X 78mm X 79mm. Available (US) in April '08. Below are some samples from my hiking adventures over the past month. All were taken with the Panasonic FX100 tiny pocket camera. The shots are for your enjoyment only, as I've cropped and jacked the colors on most. If you like very colorful flower shots, you'll really get an eye full from the 17 pictures here. If you really hate flowers and color, don't go there. I'm planing on starting up my lens reviews once again. This time it's the Sony 500mm F/8 reflex lens. I should be able to have it ready by next weekend.